If you are looking to spruce up your linen cupboard with some fresh bolster cases or if it is time to replace those tired tea towels and soiled doilies, then these two lovely gentlemen are here to help. They have some super feather eiderdowns and quality blanket sets to keep you snug and cosy on frosty nights, and it is all going for a song. 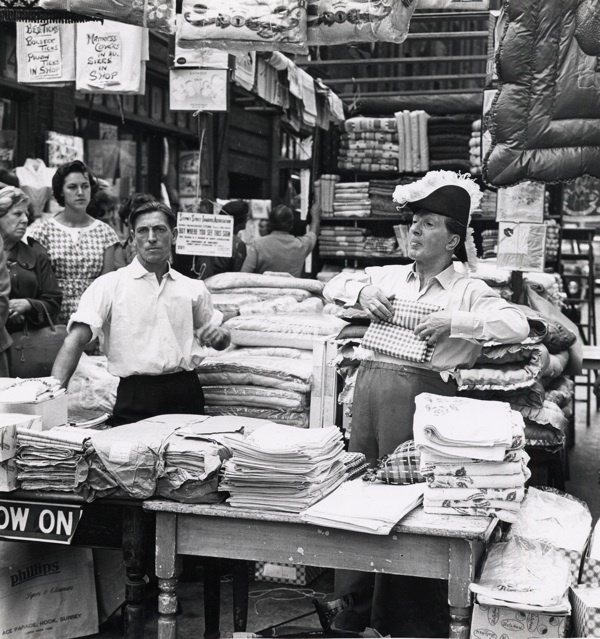 One Summer Sunday in the nineteen fifties, Dennis Anthony took his camera down Petticoat Lane to capture the heroes of the epic drama of market life – all wearing their Sunday best, properly turned out, and even a little swanky. There is plenty of flash tailoring and some gorgeous florals to be admired in his elegant photographs, composed with dramatic play of light and shade, in compositions which appear simultaneously spontaneous and immaculately composed. 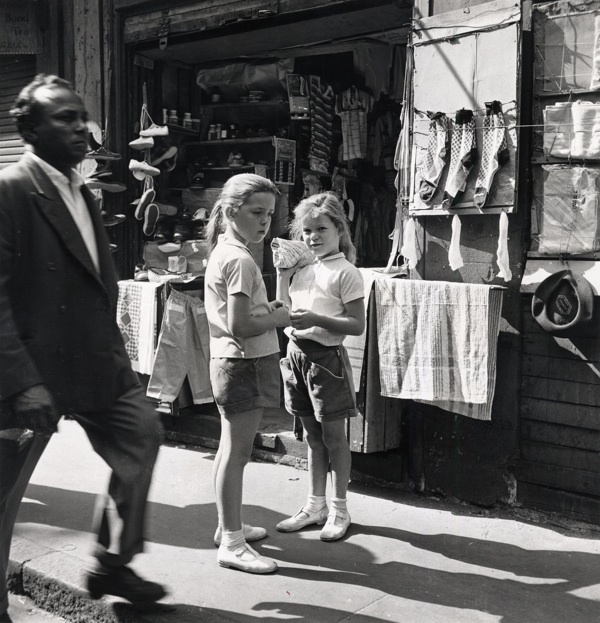 Each of these pictures captures a dramatic moment – selling or buying or deliberating – yet they also reward second and third glances to scrutinise the bystanders and all the wonderful detail of knick-knacks gone long ago. 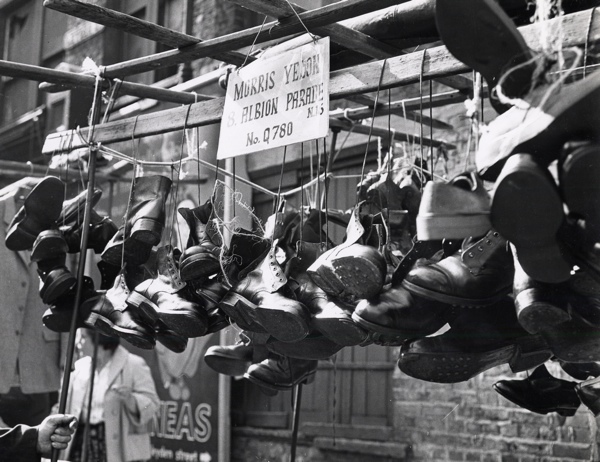 When the West End shops shut on Sundays, Petticoat Lane was the only place to go shopping and hordes of Londoners headed East, pouring through Middlesex St and the surrounding streets that comprised its seven “tributaries,” hungry for bargains and mad for novelty. How do I know this? Because it was the highlight of my parents’ honeymoon, when they visited around the same time as Dennis Henry, and I grew up hearing tales of the mythic Petticoat Lane market. I wish I could buy a pair of those hob-nailed boots and that beret hung up beside the two sisters in shorts, looking askance. 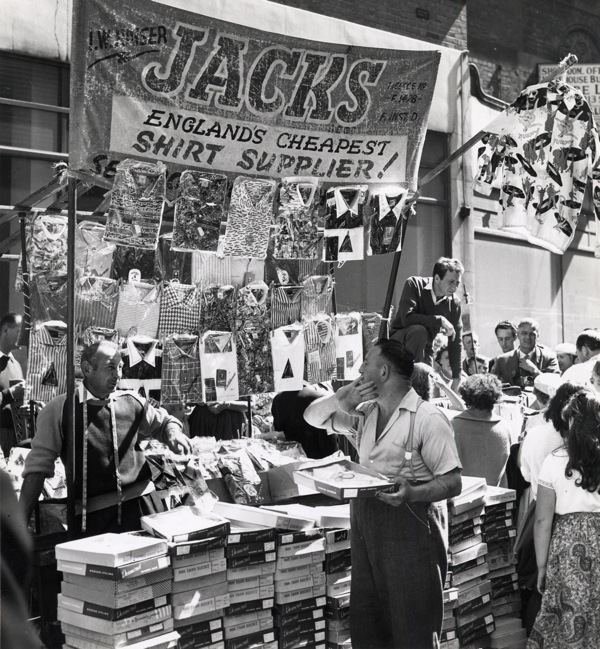 But more even than these, I want the shirt with images of records and Lonnie Donegan and his skiffle group, hung up on Jack’s stall in the final photograph. Satisfied with my purchases, I should go round to Necchi’s Cafe on the corner of Exchange Buildings and join those distinguished gentlemen for refreshment. Maybe, if I sat there long enough, I might even glimpse my young parents come past, newly wed and excited to be in London for the first time? 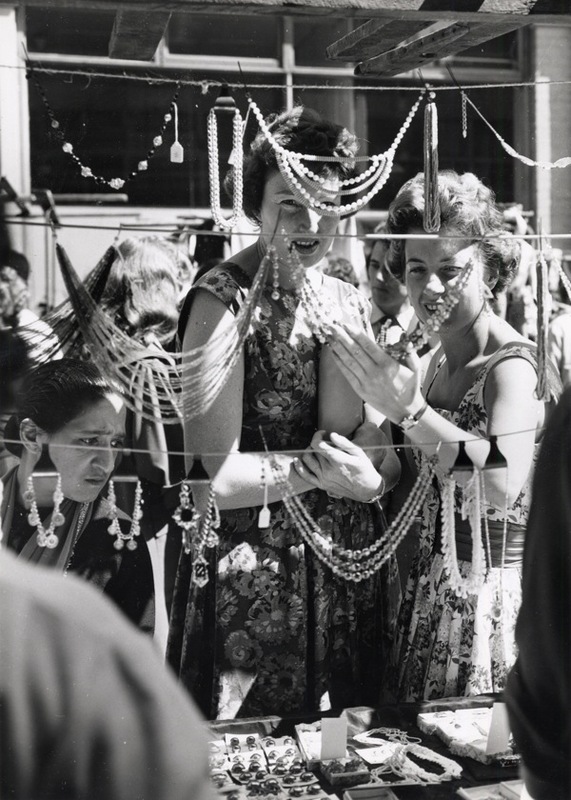 I am grateful to the enigmatic Dennis Anthony for taking me to Petticoat Lane in its heyday. I should like to congratulate him on his superlative photography, only I do not know who he is. 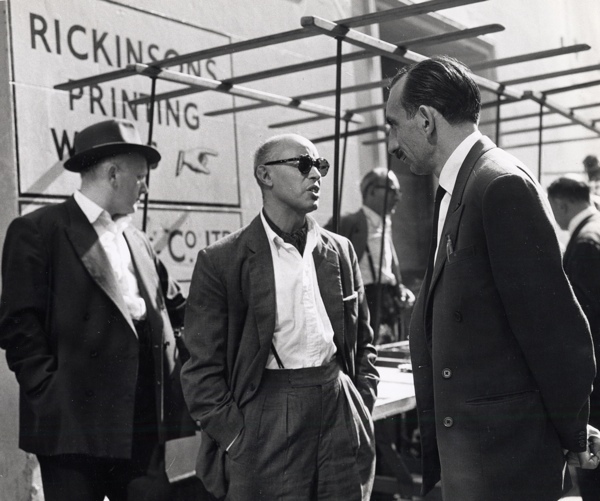 Stefan Dickers, the archivist at the Bishopsgate Institute, bought the prints you see here on ebay recently and although they are labelled Dennis Anthony upon the reverse, we can find nothing more about the mysterious photographer. So if anyone can help us with information or if anyone knows where there are further pictures by Dennis Anthony – Stefan & I would be delighted to learn more. Can’t help with the identity of the photographer but recognised immediately the chap in the admirals hat in the first photo. 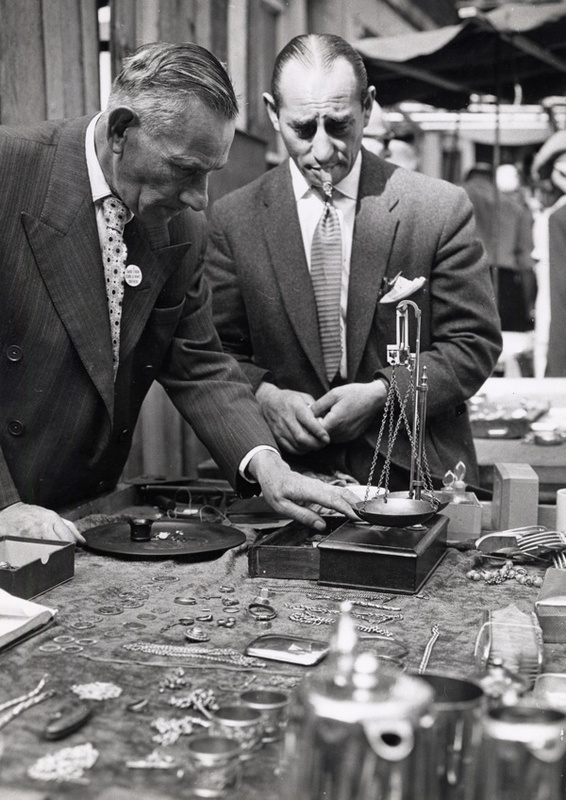 Trust me …….. as a ten year old in 1933 I spent a lot of Sundays in the Lane and he was the undisputed king of the traders there! Thanks again Gentle Author for this glimpse of the past. Ron – do you recall by any chance a Jewish bakery called Morris on Cable Street? Just after the war my mum used to sell fruitcake for her baker father on Petticoat Lane Market. As a shy teenager, she hated having to do it, but he wasn’t a man you could say no to. It is definitely Mike Stern in the admirals hat. My father used to take me there when I was a toddler in the 50s and I remember him well. 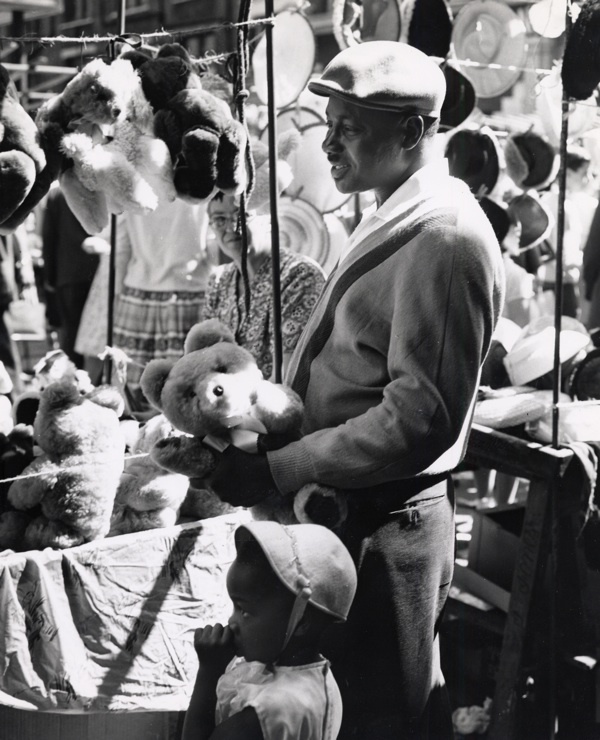 He and his wife used to get donations of stage dresses from the stars and sell them for charity. People like Alma Cogan gave generously to them. Wow – wonderful memories of buying all the baby pram sets, table linen etc..
What a find! And what a mystery. I’m sure, like Ron Goldstein above, knowledgeable locals will be able to fill in the gaps. I wonder who the beautiful little girl in her Sunday best in those last two photos is & will she be found? I remember people always talking about this market – it was THE market to go to. One of Mike Stern’s gimmicks to draw a crowd was to sit on top of a stepladder. 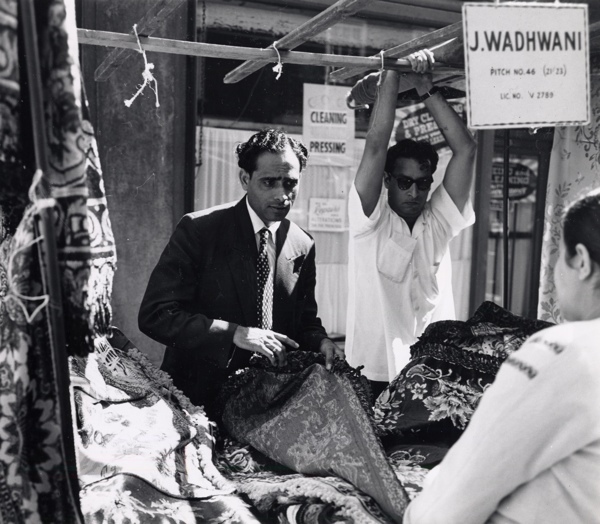 Quite apart from the traders of merchandise there were sellers of tricks, escapologists and a chap who sold that wonderful chemical that turned black fire-side fenders into immediate gold coloured wonders. If you returned to the stall a wek later the stall owner was using the identical props but no one ever asked him why it had returned to it’s original black ! 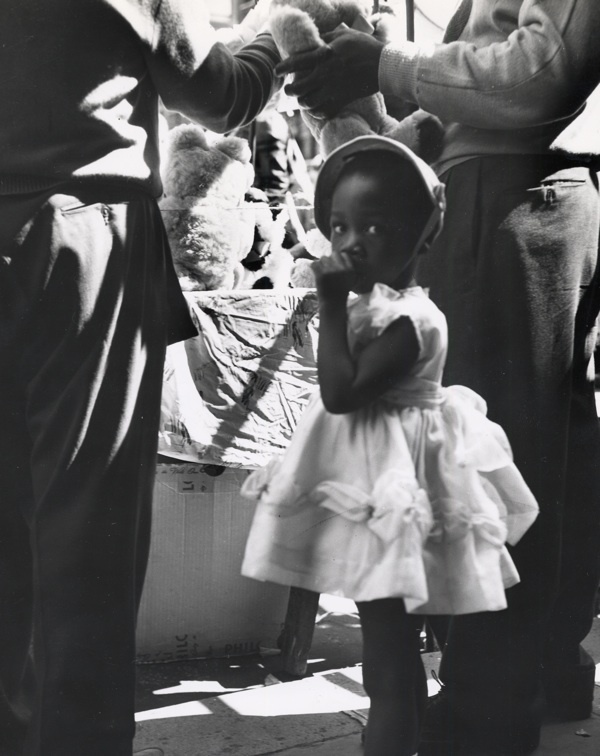 I love the little girl with the thumb in her mouth — looks like she’s waiting for her dad to buy her a teddy bear. As a resident of Wentworth Street for 22 years it is definitely Mike Stern in that picture Though I am not sure where the other photo’s were taken. 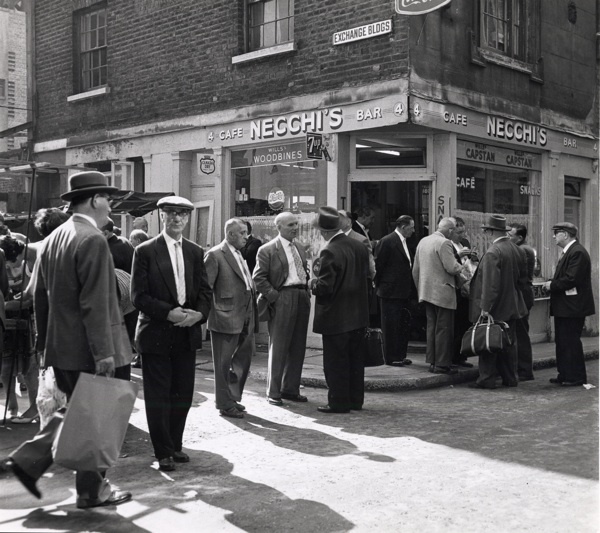 They were not in Wentworth Street or as far as I can remember Middlesex Street (Petticoat Lane) I have never heard of Necchi’s Cafe or Exchange Buildings and do not know the location. I also would like to know who the photographer was wonderful pictures. Excellent photographs, many thanks for putting these on the web. Exchange buildings were off of Houndsditch. It led to the rear of the jewellers shop which was burgled at the start of the Siege of Sydney Street. See this section of this brilliant website! Dennis Anthony is my father, and I am very proud of him. He is still alive, too! Hi I worked in wentworth st opposite Mossy Marks he was such a lovely man used to make jokes with me all the time because lunchtimes I used to go across and buy latkas for the girls lunch. On Sunday we only worked half day and my friend and I used to work in the sister shop in Middlesex st loved every single minute and a very good friend of mine had a stall outside Mossy Marks selling tights his name was Benny Josephs sadly passed away many years ago.I remember very well the lady with the pickled cucumbers. Mike Stern was my great uncle. I never got to meet him but I had the pleasure of having high tea with his wife, my Aunt Faye, in 1976. My dad (who died in 2007) had wonderful stories about Uncle Mike and somewhere in the house I have loads of photos of him (that is definitely him) and the family. Mike was also my great uncle — and I did have the pleasure of meeting him in 1971 shortly before his passing. Mike was wonderful and the stories went on for hours entertaining me and my fellow European traveler, David Gubow. My Grandfather was Henry (known as “Lou”) Necchi and he owned the café. Various relatives including my mother and late father worked in the café.